I made these last month for the baby shower of a close friend. It’s her first boy, so we had to celebrate! She doesn’t have a nursery, but she was making a blanket in brown and blue, so I figured it was a great chance to work with an argyle pattern I’d been hoping to use! 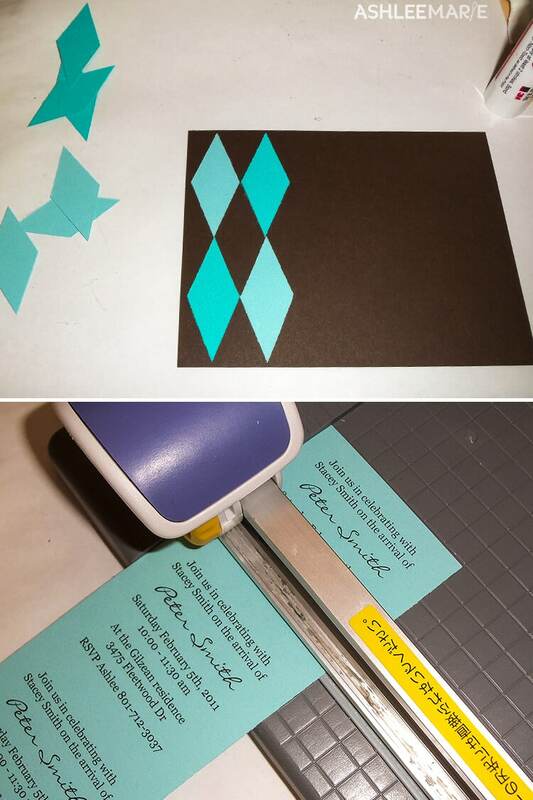 I started by cutting out two different shades of blue card stock. I just have a normal paper cutter, so I just angled the paper to get the shapes I wanted. 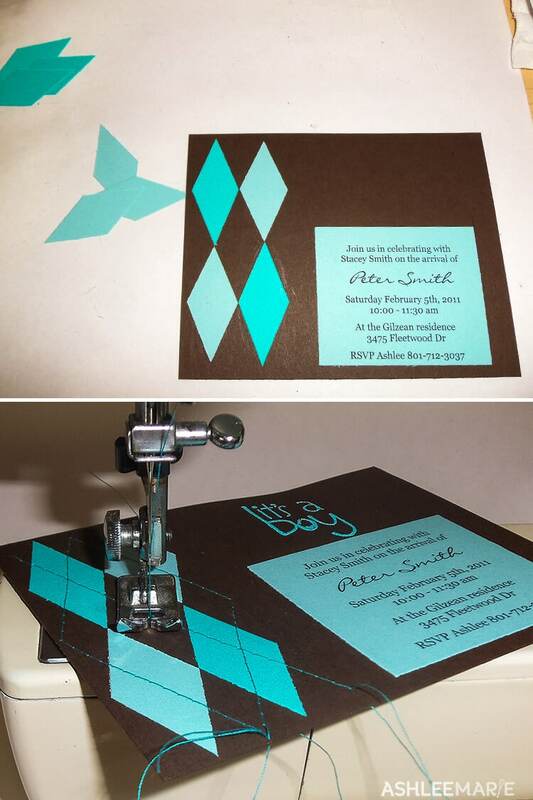 I also printed off the invitation on the blue card stock and cut it out too! Next up stamp embossing! I have embossing powder in the same shade of blue!!! Now for my favorite part… Sewing the details onto the card. Using a darker shade of blue thread I first created a diamond shape. Now to X through the design. Pull the threads through the holes and knot and trim each end. And all done! Put them in envelops and mail them and your all ready for the party! Those are so fantastic! 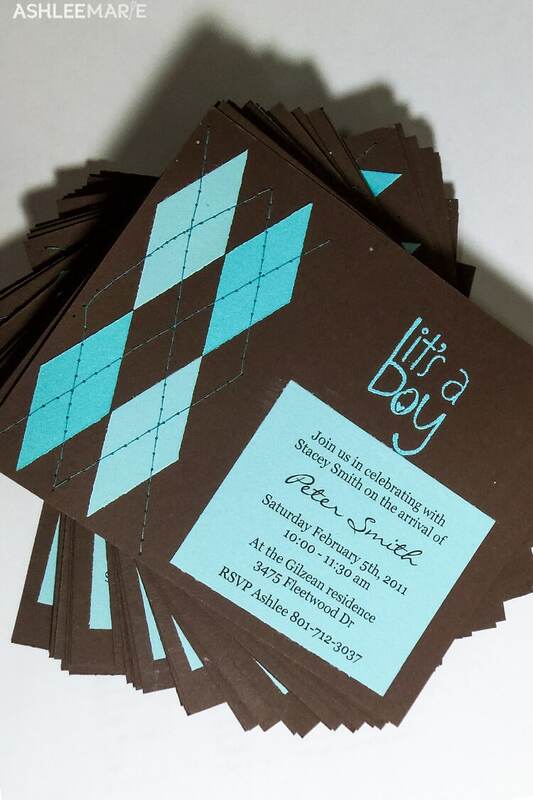 I used argyle accents at a recent birthday party and I wish I had thought to do that for the invitations. Thanks for sharing! Thanks! I’ve been in love with argyle for a few months now, just trying to come up with ways to use it! Oh ma gosh those are so flippin cute! Thanks Mandi! They were really fun to make and deliver! you totally could! I even have the It’s a Girl stamp! Let me know if you use it! These are darling! What a lot of details- totally worth it! These are the cutest cards ever!!! I love the argyle and stitching!! I’m sharing on my Facebook page! Thank you so much Beverly!!! You would know good stitching projects! And thanks for sharing it! Your so sweet! Ashlee, these are seriously darling! Love that stitching!! Thank you so much Amy! They were super fun to make! Way to go on SYTYC! Keep up the good work! Did you use 8 1/2 x 11 sheet or a 12 x 12 sheet? For the main part. together with your informative site post. back here, thanmks for posting this info and I Have saved the site! yes i do truly love what I do, glad you have found that happiness as well!